Derek McGinnis, a hospital corpsman in the U.S. Navy, was dispatched to pick up wounded marines during the 2004 Fallujah Offensive in Iraq. As his Humvee ambulance paused on the street, it was broadsided by a suicide driver, whose vehicle exploded on impact and ripped the ambulance to shreds. If this had happened in a previous war, Derek would be dead. His left leg was nearly blown off, the entire right side of his face and much of his body was mutilated beyond recognition with flying shell fragments, his right eye was severely damaged, and his brain jarred dangerously in the blast. Within minutes of his arrival, a nurse ran to the mess hall and jumped up on a table to activate a walking blood bank. “If you haven’t had a tattoo or been treated for anything in a year, get to the SST and give blood now!” she shouted. Within two hours, the nurse, a lieutenant in the Navy Nurse Corps, boarded a helicopter with the sedated corpsman: They headed for Balad where there a larger hospital with more resources awaited their arrival. Derek, who miraculously survived, struggled for years with horrific pain related to his injuries, but found there was no map to steer him through the minefield toward recovery. So, he wrote a book, Exit Wounds, that contains the information his family and he desperately needed back in 2004. The book is both a guide to pain management for veterans and their family members, and the inspiring story of how one man fought to survive and even thrive despite his traumatic injuries and painful path to recovery. Hundreds of thousands of military personnel have returned and will continue to return from the wars in Iraq and Afghanistan, many struggling with acute pain and facing the possibility of a lifetime of chronic pain. “They and their families deserve a resource to help them navigate through the barriers and obstacles that can prevent effective pain care,” said Derek. 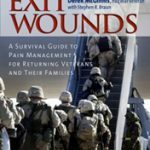 Exit Wounds is currently being distributed to veterans and service members for free through the Wounded Warrior Project and the Injured Marine Semper Fi Fund. Derek continues to search for partners to support the printing of the book so that it can be given for free to every service member, veteran, or family member who needs one. It is available to civilians through Amazon. Derek now serves as the Military/Veterans Initiative Amputee Outreach Advocate with the American Pain Foundation and travels the country advocating for the pain management needs of veterans, military personnel and their caregivers. He competes in endurance races to raise money for the Semper Fi Fund.